Xerte Online Toolkits version 3.0 is out! It gives us a great pleasure to announce, on behalf of the fantastic people that are the Xerte project's community of developers, that the next version of the software, Xerte Online Toolkits v3.0, will be available for download from the Xerte Community website. This is a significant release in several ways: it is our first release as an Apereo Community project and marks our graduation from the incubation process, and it is also our first release as an affiliate member of the Open Source Initiative - we are very proud to of both of these achievements, which clearly establish The Xerte Project as both a sustainable and robust project. The Apereo community provides exciting opportunities for the project to grow and develop in the future. 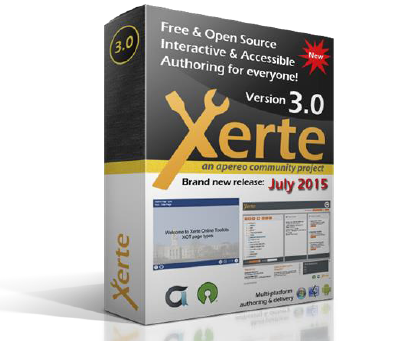 Read more: Xerte Online Toolkits V3 is out!! !